Those of you who've followed me for a bit know that before I was a quilter, I was an embroiderer, and before that, a knitter. I am all three all the time now (phew! no wonder I get tired! ), but I am always and forever will be a knitter. In fact, I imagine Heaven is the home of the most fabulous yarn shoppe... but I digress. What a motley crew! My grandfather would've described this collection as 'six of a dozen, assorted' -- and rightly so! Bent, misshapen, varying lengths and quantities. Sigh. 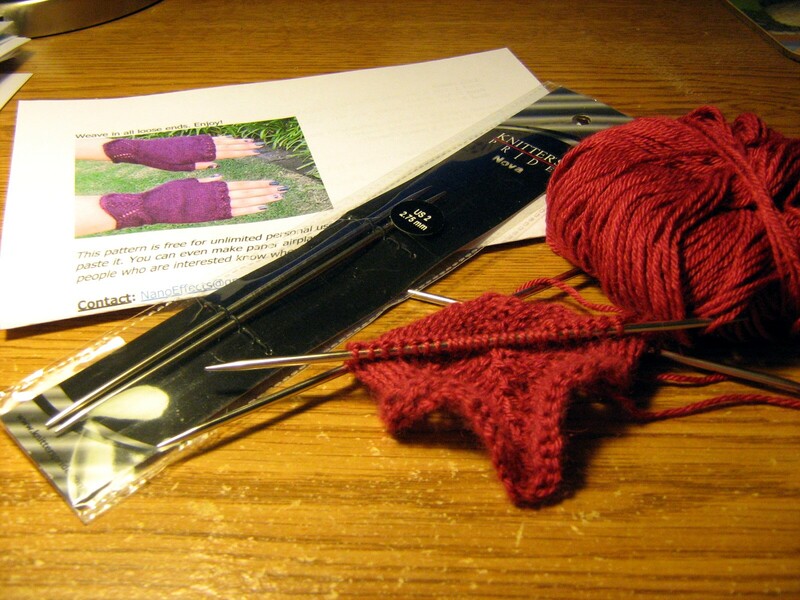 What's a sock-knitter to do? 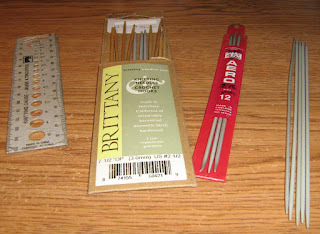 They're Knitter's Pride Nova DPNs, 2.75 mm, five in a set, 6" long, shiny, lightweight, smooth, sharp-pointed (but not so you'd prick your finger), and perfect for my latest project. Here you see them being modelled in the first of a pair of Short n Sweet Fingerless Mitts, designed by Anne Sahakian, and available as a free download on Ravelry. The yarn is Peruvian Baby Silk (80% baby alpaca; 20% silk), from Elann's Peruvian collection. I amassed an inordinate amount of this (and it's look-alike, Baby Cashmere) in raspberry -- and a bit in other colours -- several years ago, and tend to knit it up in delicious 1, 2 or 3-ball projects (this one takes 2) for special people's special occasions. (In this case, my friend B is having a birthday at the beginning of February.) My hands love to knit with this yarn, and now, on these needles...well, as I said, I think I'm in love! Thanks for sharing. 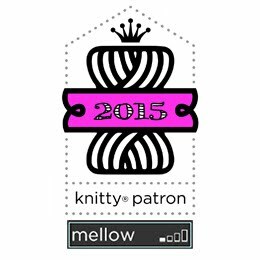 I need all the help I can get when it comes to knitting on DPNs. I need to try something other than bamboo. Off to check out the link. Love little metal needles too. I have done a number of socks over the last 10 years or so. I have not been knitting because of my Wrist. When I knit I have trouble then machine quilting ( I of cause make a living Machine quilting). You will have to show off your next pair of socks. I see wrist covers on the go. My mom made me a pair last year. Looks like very nice yarn. I should try something other than the mainly acrylic stuff I have. 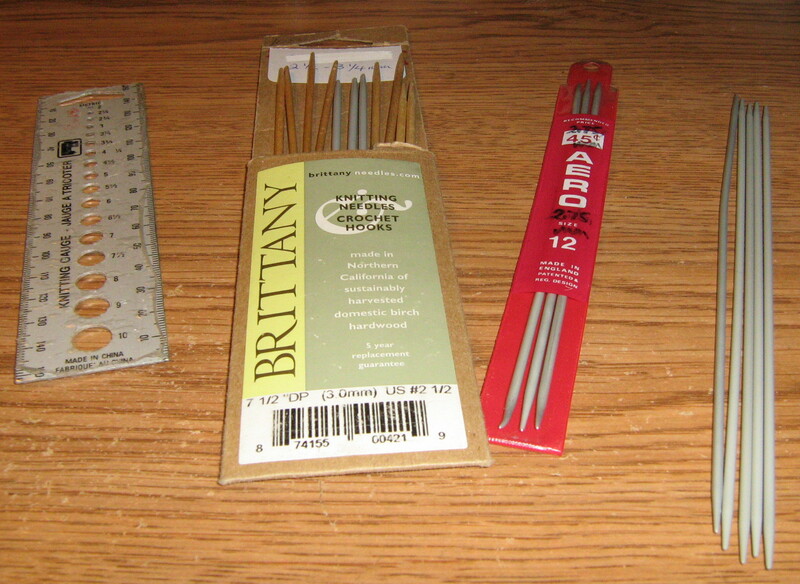 I much prefer metal needles too. Plastic are not slippery enough and bamboo, not for me.